Ukrainian earth ionosphere satellite. Studied charged particle flows and the ionosphere; version used for Intercosmos international launches. Status: Operational 1970. First Launch: 1970-08-07. Last Launch: 1975-12-11. Number: 7 . East European experiments studied protons, electrons, alpha particles. Design work began in April 1967. 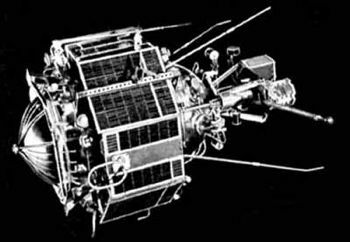 Adaptation of DS satellites by KB Yuzhnoye. 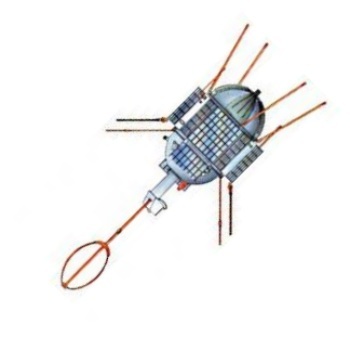 For the Interkosmos modifications V F Chutkin was Chief Designer and First Assistant was V S Budnik. Family: Earth, Ionosphere sat. Country: Ukraine. Launch Vehicles: Kosmos 2, R-12, R-14, Kosmos 11K63, Kosmos 3, Kosmos 11K65M. Launch Sites: Kapustin Yar, Plesetsk, Plesetsk LC132/2, Kapustin Yar LC86/4, Plesetsk LC132/1. Agency: IK, Yuzhnoye. Bibliography: 116, 2, 6, 99, 12279. Design work begins on Interkosmos version of DS - . Nation: Russia. Spacecraft: DS-U1-IK, DS-U2-IK. For the Interkosmos modifications V F Chutkin was Chief Designer and First Assistant was V S Budnik. East European experiments studied protons, electrons, alpha particles..
1970 August 7 - . 02:59 GMT - . Launch Site: Kapustin Yar. Launch Complex: Kapustin Yar LC86/4. LV Family: R-12. Launch Vehicle: Kosmos 11K63. Intercosmos 3 - . Payload: DS-U2-IK s/n 1. Mass: 340 kg (740 lb). Nation: Russia. Agency: MO. Program: DS. Class: Earth. Type: Ionosphere satellite. Spacecraft Bus: DS. Spacecraft: DS-U2-IK. Completed Operations Date: 1970-12-04 . Decay Date: 1970-12-06 . USAF Sat Cat: 4482 . COSPAR: 1970-057A. Apogee: 1,294 km (804 mi). Perigee: 201 km (124 mi). Inclination: 48.40 deg. Period: 99.80 min. Studied charged particle flows and the ionosphere. Carried East European experiments that studied protons, electrons, alpha particles..
1971 December 2 - . 08:25 GMT - . Launch Site: Kapustin Yar. Launch Complex: Kapustin Yar LC86/4. LV Family: R-12. Launch Vehicle: Kosmos 11K63. Intercosmos 5 - . Payload: DS-U2-IK s/n 2. Mass: 340 kg (740 lb). Nation: Russia. Agency: IK. Program: DS. Class: Earth. Type: Ionosphere satellite. Spacecraft Bus: DS. Spacecraft: DS-U2-IK. Decay Date: 1972-04-07 . USAF Sat Cat: 5641 . COSPAR: 1971-104A. Apogee: 1,181 km (733 mi). Perigee: 198 km (123 mi). Inclination: 48.40 deg. Period: 98.50 min. 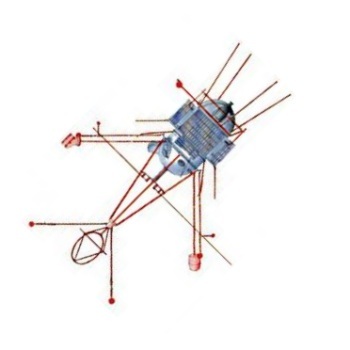 Carried Czech and Soviet instruments that investigated the effects of solar activity on near-Earth radiation. Studied the radiation levels in near-Earth space, investigated dipole corpuscular streams in near space in connexion with solar activity and investigation of the nature and spectrum of low-frequency electromagnetic oscillations in natural plasma. 1973 April 19 - . 10:19 GMT - . Launch Site: Kapustin Yar. Launch Complex: Kapustin Yar LC86/4. LV Family: R-12. Launch Vehicle: Kosmos 11K63. Intercosmos 9 - . Payload: DS-U2-IK s/n . Mass: 400 kg (880 lb). Nation: Russia. Agency: IK. Program: DS. Class: Earth. Type: Ionosphere satellite. Spacecraft Bus: DS. Spacecraft: DS-U2-IK. Completed Operations Date: 1973-10-15 . Decay Date: 1973-10-15 . USAF Sat Cat: 6433 . 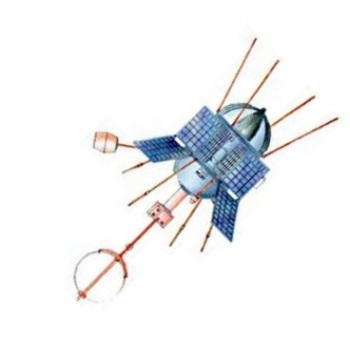 COSPAR: 1973-022A. Apogee: 1,526 km (948 mi). Perigee: 199 km (123 mi). Inclination: 48.40 deg. Period: 102.20 min. Also designated Intercosmos Copernicus 500. Investigated solar radio-frequency radiation and the characteristics of the earth's ionosphere..
1973 October 30 - . 19:00 GMT - . Launch Site: Plesetsk. Launch Complex: Plesetsk LC132/2. LV Family: R-14. Launch Vehicle: Kosmos 11K65M. Intercosmos 10 - . Payload: DS-U2-IK s/n 3. Mass: 550 kg (1,210 lb). Nation: Russia. Agency: IK. Program: DS. Class: Earth. Type: Ionosphere satellite. Spacecraft Bus: DS. Spacecraft: DS-U2-IK. Completed Operations Date: 1974-06-07 . Decay Date: 1977-07-01 . USAF Sat Cat: 6911 . COSPAR: 1973-082A. Apogee: 1,453 km (902 mi). Perigee: 257 km (159 mi). Inclination: 74.00 deg. Period: 102.00 min. Geophysical research at high latitudes to study the electromagnetic coupling of the earth's magnetosphere and ionosphere..
1974 October 31 - . 10:00 GMT - . Launch Site: Plesetsk. Launch Complex: Plesetsk LC132/2. LV Family: R-14. Launch Vehicle: Kosmos 11K65M. Intercosmos 12 - . Payload: DS-U2-IK s/n 4. Mass: 400 kg (880 lb). Nation: Russia. Agency: IK. Program: DS. Class: Earth. 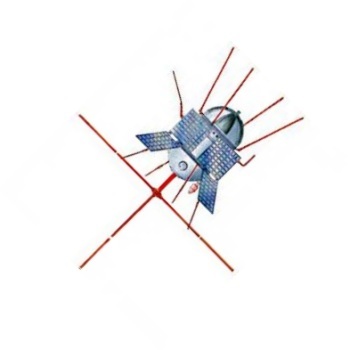 Type: Ionosphere satellite. Spacecraft Bus: DS. Spacecraft: DS-U2-IK. Completed Operations Date: 1975-02-20 . Decay Date: 1975-07-11 . USAF Sat Cat: 7500 . COSPAR: 1974-086A. Apogee: 707 km (439 mi). Perigee: 243 km (150 mi). Inclination: 74.00 deg. Period: 94.10 min. Atmospheric, ionospheric research. Comprehensive investigation of the earth's atmosphere and ionosphere and of micrometeorite fluxes..
1975 March 27 - . 14:30 GMT - . Launch Site: Plesetsk. Launch Complex: Plesetsk LC132/1. LV Family: R-14. Launch Vehicle: Kosmos 11K65M. Intercosmos 13 - . Payload: DS-U2-IK s/n 5. Mass: 400 kg (880 lb). Nation: Russia. Agency: IK. Program: DS. Class: Earth. Type: Ionosphere satellite. Spacecraft Bus: DS. Spacecraft: DS-U2-IK. Completed Operations Date: 1975-06-21 . Decay Date: 1980-09-02 . USAF Sat Cat: 7710 . 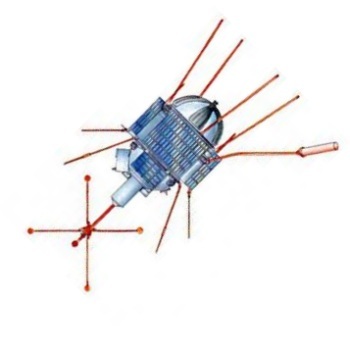 COSPAR: 1975-022A. Apogee: 1,689 km (1,049 mi). Perigee: 284 km (176 mi). Inclination: 83.00 deg. Period: 104.90 min. Upper atmospheric experiments. Study of dynamic processes in the earth's magnetosphere and polar ionosphere and investigation of low-frequency electromagnetic waves..
1975 December 11 - . 17:00 GMT - . Launch Site: Plesetsk. Launch Complex: Plesetsk LC132/1. LV Family: R-14. Launch Vehicle: Kosmos 11K65M. Intercosmos 14 - . Payload: DS-U2-IK s/n 6. Mass: 700 kg (1,540 lb). Nation: Russia. Agency: IK. Program: DS. Class: Earth. Type: Ionosphere satellite. Spacecraft Bus: DS. Spacecraft: DS-U2-IK. Completed Operations Date: 1976-07-09 . Decay Date: 1983-02-27 . USAF Sat Cat: 8471 . 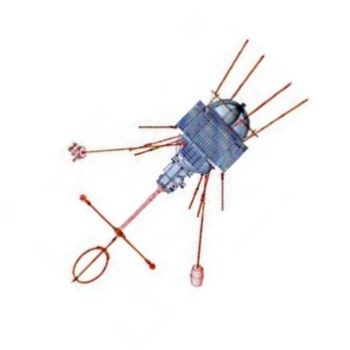 COSPAR: 1975-115A. Apogee: 1,684 km (1,046 mi). Perigee: 335 km (208 mi). Inclination: 74.00 deg. Period: 105.30 min. 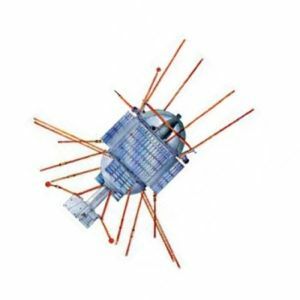 Study of low-frequency electromagnetic vibrations in the magnetosphere of the earth, of the structure of the ionosphere and of the intensity of micrometeorite fluxes..